Hortus Camdenensis | Gladiolus orchidiflorus Andr. A cormous perennial with up to 8, linear sword-shaped, grass-like leaves, to 40cm, and a longer stem, sometimes branched, bearing a lax spike of up to 12 medium-sized, very fragrant, greenish-grey flowers with dark stripes, in summer. [RHSD, Hortus, CECB]. ‘Our drawing of this very rare and singular vegetable was taken at Mr. Woodford’s, who received the bulbs this Spring from the Cape. To all appearance it is equally hardy and of as easy culture as any of its congeners from the same country; many specimens flowered together in the above collection, and shewed some slight variety both in size and colour. The fanciful appellation of viperatus, bestowed by old Plukenet, and which we first thought might have been suggested by the chequered, brownish appearance of the flowers of some of the varieties, now appears to us more probably to have been taken from the form of its flowers, which (especially as represented in his own figure) do bring to mind the position of the head and appearance of the jaws of the snake when raising itself for defence against its enemy and hissing, in which state we often see them represented in cuts accompanying natural history.’ [BM t.688/1803]. 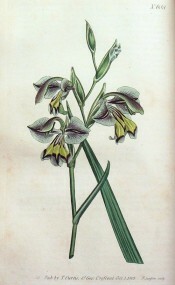 According to Johnson's Dictionary introduced to Britain in 1787 as Gladiolus viperatus. Andrews' Botanical Repository gives a date of 1801, by Niven, for Gladiolus orchidiflorus: ‘As a singularity among its fellows, this gladiolus stands prominently distinct; and the uncommon and curious formation of its flowers will, undoubtedly, counter balance, in the eye of the botanist, what they want in brilliancy of colour.’ [ABR pl.241/1802]. OFG f.229/1854. Listed in the 1845, 1850 and 1857 catalogues [B.170/1845]. Probably introduced by John Bidwill. [See Gladiolus cardinalis Curt. ].